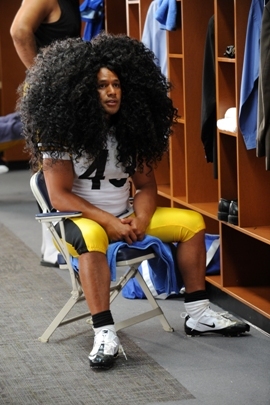 Troy Polamalu is a lot of things. He’s a bone-crushing, acrobatic force of nature on the football field. He’s a family man, a piano player and a deeply spiritual and soft-spoken dude. He’s the key to the Pittsburgh’s playoff hopes this season. When he’s not covering the entire football field on every defensive snap, he grows flowers, makes furniture and serves as the spokesman for head & shoulders. It’s a brilliant pairing, really. Polamalu’s hair has become his trademark. The guy hasn’t been to a barber shop in over seven years, so he obviously knows how to take care of that crazy mane. Well head & shoulders is taking care of Troy’s hair, too. Big time. It was announced today that the company has taken out a $1 million insurance policy on Troy’s signature hair. “head & shoulders has gone above and beyond this year by insuring my Samoan locks for a cool $1 million. This reinforces that my full and thick hair is unstoppable,” Polamalu said. Polamalu’s hair will be protected throughout the NFL season by Lloyd’s of London, one of the most prestigious insurance agencies in the world. “In developing this unique policy, we recognize that Troy Polamalu’s famed head of hair is truly legendary and we are proud to partner with head & shoulders to protect it,” said Jonathan Thomas of Watkins Syndicate at Lloyd’s of London. Troy’s hair is such a useful marketing tool that it’s been given its own website – TroysHair.com. You can visit the interactive site to learn more about Troy’s hair (end to end it spans over 100 football fields), Hair Endurance for Men from head & shoulders and possibly win some NFL prizes like a VIP package to Super Bowl XLV. Print article This entry was posted by Chris Stout on August 30, 2010 at 1:08 pm, and is filed under News. Follow any responses to this post through RSS 2.0. Both comments and pings are currently closed.